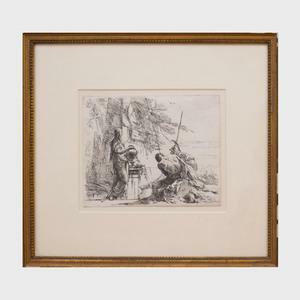 Find artworks, auction results, sale prices and pictures of Giovanni Battista Tiepolo at auctions worldwide. 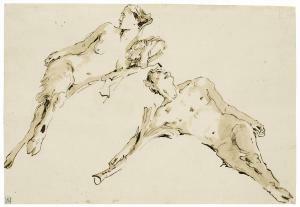 Giovanni Battista Tiepolo (Venice 1696-1770 Madrid) A male and female faun reclining black chalk, pen and brown ink, brown wash 7 ¼ x 10 ½ in. (18.4 x 26 cm) Provenance Baron Louis-Auguste de Schwiter, Paris (1805-1889) (L.1768); Hôtel Drouot, Paris, 20-21 April 1883, lot 136 (\‘Faunes. Figures décoratives pour des voussures. Plume et sepia.\’) with Flavia Ormond Fine Arts, New York and London (Master Drawings, 2004, no. 9). Private collection. with Stephen Ongpin Fine Art, London, 2009, where acquired. Giovanni Battista Tiepolo (Venedig 1696 - 1770) Aus: Scherzi di Fantasia Radierung, 22 x 17 cm, l. u. in der Platte sign. G. B. Tiepolo, min. besch. - Blatt 8 aus der Serie 'Scherzi di Fantasia', ungerahmt. - Literatur: De Vesme 20-1. - Italienischer Maler und Graphiker, einer der bedeutendsten Meister der Barock- und Rokokomalerei. Sein Hauptwerk sind die Fresken der Würzburger Residenz. Mus. : Paris (Louvre), New York (Metrop. Mus. ), München (Alte Pinakothek) u.a. Lit. : Thieme-Becker, Bénézit u.a. 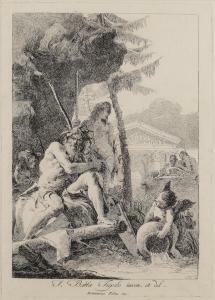 Tiepolo, Giovanni Battista (Venedig 1696 - 1770) From: Scherzi di Fantasia Etching, 22 x 17 cm, lo. le. in the plate sign. G. B. Tiepolo, min. dam. - Plate 8 from the series 'Scherzi di Fantasia', unframed. - Literature: De Vesme 20-1. - Italian painter and graphic artist, one of the most important painter of baroque and rococo. His masterpieces are the frescoes of the Würzburg residence. Mus. : Paris (Louvre), New York (Metrop. Mus. ), Munich (Alte Pinakothek) a. others. Lit. : Thieme-Becker, Bénézit a. others. 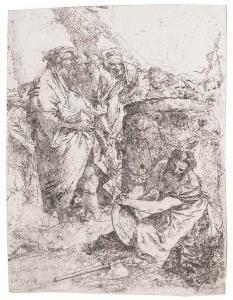 259 Giovanni Battista Tiepolo (1696-1770): Capricci: Standing Woman and Seated Man Etching in black on laid paper. 5 1/2 x 7 1/8 in. (sheet), 11 3/4 x 13 1/4 in. (frame). Literature: De Vesme 6; Rizzi 32. Property from the Estate of a Distinguished Gentleman Condition: With thin margins. Several tiny and unobtrusive foxmarks. Otherwise apparently in very good condition. Not examined out of frame. Full sheet visible.